If I had to eat one vegetable for the rest of my life...hands down, it would be potatoes. My mom's an Idaho girl, so there must be a little Idaho running through my veins, because I am in love with potatoes. I have never met a potato I didn't devour. In my single days, living in Salt Lake, I used to cook all the time for my friends. We would have weekly Sunday dinners where everyone would come over eat and play games. This dish is probably one of my most famous among my friends. It's the ultimate Sunday comfort food and pairs well with just about anything. I love to play with different spices, herbs, and cheeses in this dish and therefore have several variations up my sleeve. This particular recipe I consider the classic version. Over time I'll post some of the different versions I've come to love. This dish is supposed to serve about 6 people, but if you like potatoes as much as we do around here...it may only serve 4. 1. Place cubed potatoes, onion, garlic, and salt in a large stock pot. Fill with water until potatoes are just covered. Cook until potatoes are fork tender. 2. Drain water, be sure not to drain off the onion or garlic. 3. 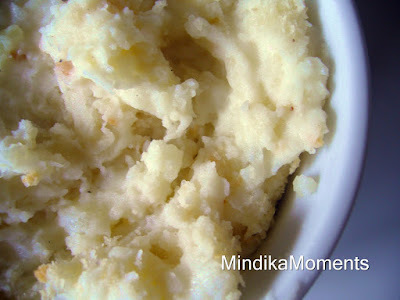 With a hand masher, mash potatoes until smooth but still a little lumpy. 4. Add butter, cream cheese, sour cream, and milk. Continue to mash until the all ingredients are incorporated. 5. Stir in shredded cheese, pepper and nutmeg. 6. Spoon potatoes into a 10 inch (or 9x13) baking dish. 7. Sprinkle Panko bread crumbs on top. 8. Bake at 350 degrees for 15-20 minutes or until bubbly around the edges. For the last 3-5 minutes of baking, turn on your broiler to brown the bread crumbs. I can see why you love these potatoes! Definitely comfort food!